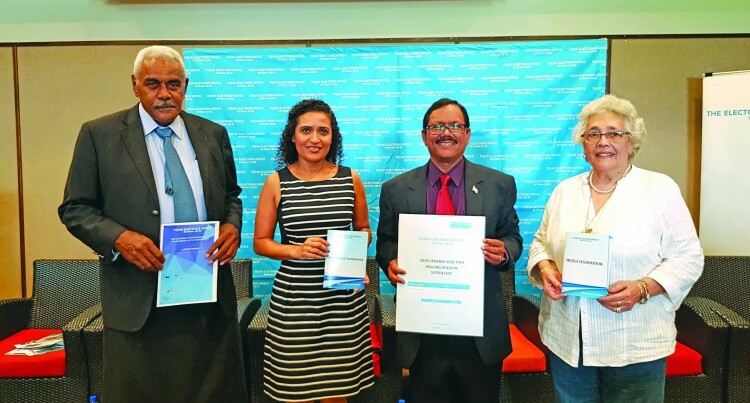 The Fijian Elections Office (FEO) launched their 2018 General Elections Publication handbook at the Holiday Inn in Suva yesterday. Electoral Commission chairperson, Suresh Chandra along with the Supervisor of Elections, Mohammed Saneem conducted the launching of the handbooks. The publications consists of a Candidates Handbook, the Media Handbook, the Provisional Voter List Handbook and the Provisional Polling Venue Handbook. Mr Chandra said that the FEO had compiled all these responsibilities in booklets to assist the media and the candidates to understand their roles within the process. “We believe that once all stakeholders beef up their capacities on elections, it will contribute to the enhancement of the credibility of the elections. “The concept of free and fair election does not only rest with the Electoral Commission but the concept of free and fair election is the responsibility of every stakeholder. “And free and fair elections mean political parties, voters and the media and any other stakeholder must conform firstly to the legal principles. “And secondly, they must respect the rights and beliefs of every other person. “The Electoral Act, the Political Parties Act and the Registration of Voters Act specifically lay out the roles and responsibilities of parties and the media,” Mr Chandra said. Mr Saneem said FEO Director Operations and her team have performed exceptionally well in finalising the Provisional Voter List and the Provisional Polling Venue List. “The communications team also delivered a Media Handbook that can stand alongside international publications of a similar nature, reflecting the high standards that the FEO sets for itself. “The Legal Procedures team – Ana Mataiciwa and Mesake Dawai have conducted thorough research in their effort to compile content for the Candidates Handbook. “The Corporate Team including Procurement and Finance have also met some very tight deadlines and sometimes gone out of their way to ensure that all publications were produced on time and ready for the launch,” Mr Saneem said.